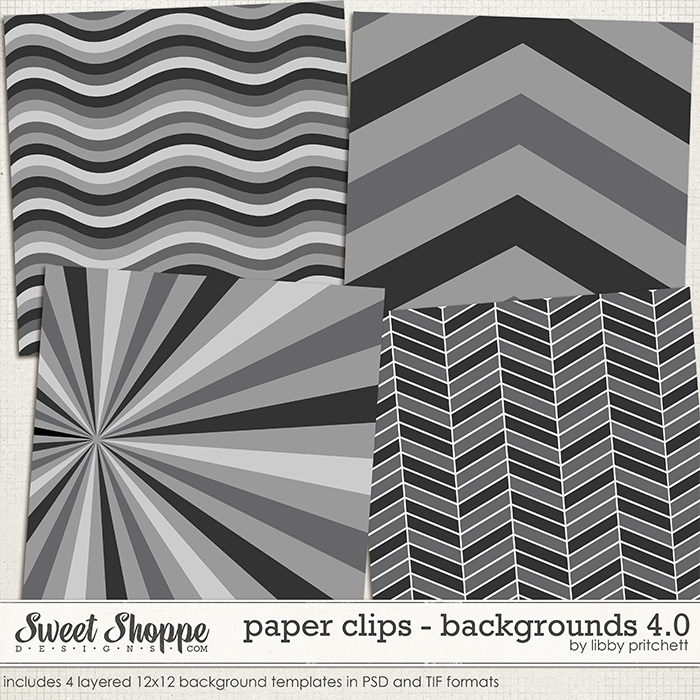 Keeping it short this week, but I wanted to share with you my new set of Paper Clips Backgrounds templates that hit the shoppe tonight. This is my 4th set of these templates, and I always love all the completely unique pages I see with them! This set is currently only available in layered PSD and TIF format because I didn't have time to convert them to PNGs before the store went live. If anyone is interested in purchasing these but needs PNG format, please let me know. I'd be happy to convert them if there is an interest. See? I told you... short & sweet! I promise to make up for it next week though when I have THREE kits planned! I've got a solo that I've been trying to get done for 2 weeks now, and I'll also be collabing with 2 awesome Sweet Shoppe Designers for 2 more fantastic kits. You won't want to miss any of it. So, I'll see you in your inbox (or here on the blog as the case may be) next Friday night!